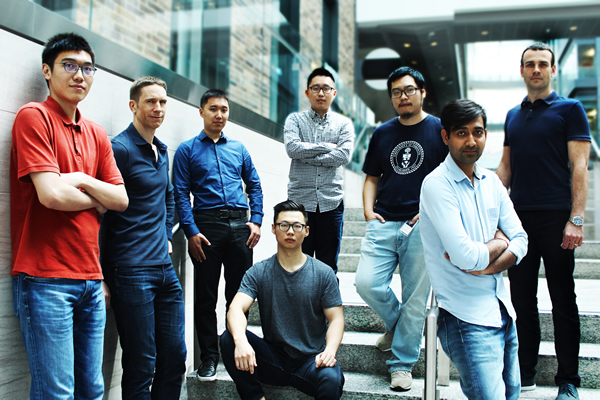 Layer 6 AI: Yichao Lu (current MScAC intern); U of T Engineering and Rotman alumnus Tomi Poutanen, co-founder and AI lead at Layer 6 & TD Bank; Guang Wei Yu (MScAC 2013-14 cohort); seated, Chundi Liu (MScAC 2016-17 cohort); Zhaoyue Cheng ( MSc, 2016-17 cohort); Ga (Wuga) Wu, (PhD intern, industrial engineering); Himanshu Rai (MScAC 2016-17 cohort); and U of T computer science PhD alumnus Maks Volkovs, co-founder Layer 6 AI. Not pictured: Google Landmark Retrieval Challenge member, Cheng Chang (MScAC 2016-17 cohort). Layer 6 AI says the win is a team effort that included U of T alumni and graduate student interns from the department of computer science’s applied computing program, as well as a partnership with Scott Sanner, an assistant professor in the Faculty of Applied Science & Engineering,and his PhD candidate Ga (Wuga) Wu, whose optimization research is in the area of data driven decision-making.